Who are the winners of the 2018 Bio Market Insights Awards? 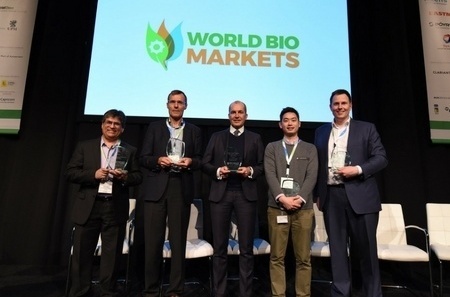 Among the many highlights of World Bio Markets this week in Amsterdam (under the ownership of Bio Market Insights for the first time) were the awarding of our 2018 Bio Market Insights Awards. After a two month process, our panel of independent industry expert judges carefully deliberated and decided our shortlist and winners. We received a varied range of submissions from around the world, with entries including gaining fuel from the fatbergs floating in our sewers, bio-based baby toys, some amazing uses of lignin and many more. But there could only be one winner for each category, so who are our 2018 winners? Highly Commended: The Chemours Company – Plant-based, water-repellent fabric…Teflon re-imagined. Bio-Based Industry Story of the Year 2018 – As voted for by the Bio Market Insights News Community. We’d like to thanks our panel of judges;· Marcel van Berkel (CEO VanBerkel Consultancy). Bridgett Luther (Co-Founder, The Disruptive Factory, founder Cradle to Cradle Products Innovation Institute), Duncan MacLeod,(Former CEO, Iogen), Melanie Williams (Director, Melanie Williams Consulting), Jeff Passmore (Founder and CEO at Passmore Group Inca), Adam Lusby (Founder, CE Optimal) and Lawrence Sullivan (Adjunct Professor, the Citadel) for their time and energy in making these awards happen. Our worthy winners received their trophies on the first day of our very successful World Bio Marketsconference hosted at Passenger Terminal in Amsterdam on 20th March 2018.